This morning, we were up at 9 a.m. After a quick shower and breakfast, we stopped by the concierge desk to ask about our options for transportation back to Gatwick Airport. The concierge told us a taxi was about £100, while Hotelink (which we used to get here from the airport) was £22 per person. The concierge was able to call in and book a time for us, based on our flight time tomorrow. He gave them our credit card info over the phone, so the payment was taken care of. We were confirmed for Hotelink, and needed to be ready and waiting at 8 a.m. tomorrow morning. Since our legs were walked out, we decided to ride the tour bus again today. There were a couple of places we wanted to visit which were much too far to walk, plus we had enjoyed the bus tour the first time, and wanted to ride again. We walked to Embankment Pier where we had gotten on board the river cruise. There was a bus tour ticket seller standing there, and we bought our bus tickets (£18 each) and also bought tickets to visit Kensington Palace for £11.50 each. As I mentioned previously, we were running short on cash, so in spite of his reluctance, the ticket taker took our credit card and was able to process it with his wireless credit card terminal. We waited about five minutes until the bus arrived. Jumping on board, we climbed the stairs to the top so we could ride in the sun and see better. 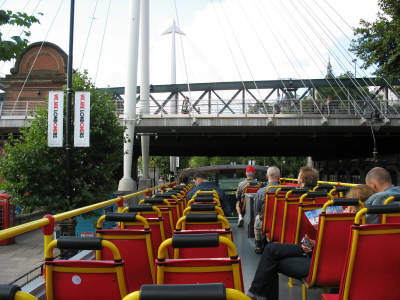 We had already decided that we would ride the bus on the blue route, which we had not ridden the first time we got a bus ticket. To get to the blue line we had to ride the yellow line into the city, get off and walk about a block to where the blue line runs. The map that the bus company gave us was easy to follow, so we had no trouble finding the blue line. Getting on the blue line, we rode out to Kensington Palace, which is the western-most stop on the route. We got off and walked through Kensington Gardens toward the palace. Kensington Gardens is a spacious public park with walkways and a pond. The palace is on the western edge of the park. We went into the palace tour entrance, where only a couple of people were in line in front of us. They searched Susan’s bag, and let us know that, even though we had already bought our ticket from the tour bus company, we could still get souvenir tickets if we wanted them. So Susan got the tickets, then we went in and were given a listening device, like we had used at Churchill’s War Room, to let us hear details about the rooms and items in the rooms. 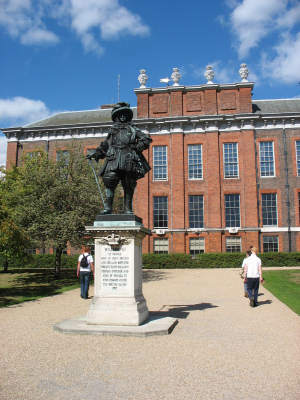 The palace was once the home of William III and Mary II during the 17th century. Princess Diana also lived here, and one part of the tour is devoted to photos of her, as well as displays of some of her dresses. The palace itself is a series of rooms where you’ll learn some about life as a monarch. Each room has a number you punch in to the audio device so you can listen to information about that room. The tour took about an hour. Photos are not allowed inside. 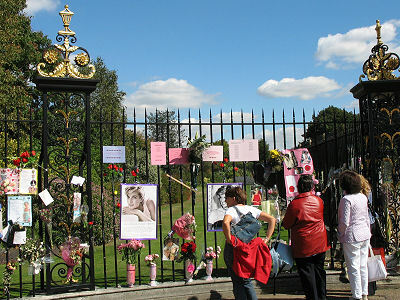 After the tour, we went out a different side of the palace to the gate and fence where thousands of mourners left flowers, cards and posters after Princess Diana was killed. There are still hundreds of new items left there today. We walked back to the bus stop and a bus came pretty quickly. However, the bus waited for a few minutes before continuing. Apparently, when the bus reaches this bus stop, it waits several minutes before leaving. I’m not sure why they wait. It may be because it’s the last stop on the western end of the tour and they want to make sure a bus is always available to customers there. Our bus waited about 10 minutes until another bus came to the stop, then we pulled out.